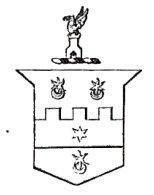 Susan Bateman was born in about 1795, the youngest daughter of James Bateman 1749-1824 of Tolson Hall in Westmoreland and Islington House, Salford in Lancashire, and his wife nee Margaret Nicholson. On 10 December 1817 she was married by licence at St John's church in Manchester to Richard Gould 1792-1868 of Willow Bank in Broughton, Salford in Lancashire. At the time of their marriage Susan Bateman was living at Islington House (1). Susan Gould. She was baptised on 10 May 1821 at St Stephen's church in Salford (2). She was married to the Reverend Henry Milne 1815-1880 in 1842 at Eccles near Manchester, and died on 27 October 1905. Frances Gould. She was born on 1 February 1825, and baptised on 3 July 1825 at St Stephen's church in Salford. In 1845 she was married at Eccles near Manchester to Major-General John Hinde 1814-1881 CB. Susan Gould died on 14 May 1828 (3), and was buried on 22 May 1828 at St Stephen's church in Salford aged 33 years. Richard Gould died on 21 July 1868 at Great Yarmouth. (1) The Morning Post dated 16 December 1817. The bride's father was also living at about that time at Islington House in Manchester : A History of the Brazil: comprising its Geography, Commerce, Colonization, Aboriginal Inhabitants, etc. J. Henderson (1821) page xv (List of Subscribers). 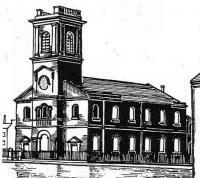 (2) St Stephen's Church in Salford, founded in 1794, was closed in 1956 and demolished. The site is now a small park between Trinity Way and St Stephen's Street. (3) "On Wednesday [[14 May 1828], in the prime of life, Susannah, wife of Richard Gould, Esq., of the Crescent, Salford, and the daughter of the late James Bateman, esq. of Islington." Manchester Guardian 17 May 1828.